Give the gift of a healthier future. For yourself, and your loved ones. A 10-minute scan may save your life. Detect heart disease long before symptoms occur with a quick 10-minute, non-invasive HeartView Scan. See an extraordinary analysis of your heart and its surrounding vessels. While no physician's order is required, some restrictions apply. For a limited time, a HeartView Scan is specially priced at $69. Heart problems can be treated sooner, and that leads to faster recovery and a healthier future. Don’t wait, get a HeartView Scan today for $69. Is heart disease a part of your future?You can answer this question with a simple test. The HeartView Scan is a noninvasive way to detect health problems before symptoms occur. The scan takes approximately 10 minutes and is performed on a state-of-the-art 64-slice CT scanner. This test measures the amount of atherosclerotic "plaque" in the coronary arteries. Plaque is the substance that builds within the walls of the arteries and can cause a heart attack if the arteries become blocked. Early detection is the key to treating heart disease. Your test result is a number that is your calcium score. The score can range from 0 to more than 400. Any score over 100 means that you are likely to have heart disease. The higher your score, the greater your chance of having a heart attack. People who score between 100 and 400 or higher, and who are at medium risk for heart disease, are more likely to have a heart attack in the next 3 to 5 years than people who score lower. 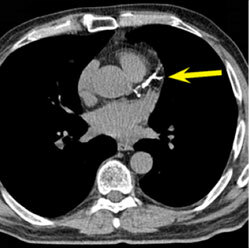 A normal coronary calcium scan of the heart, showing no plaque. Plaque shows white on the scan. The white is the calcium deposit in the artery, a strong predictor of coronary artery disease. 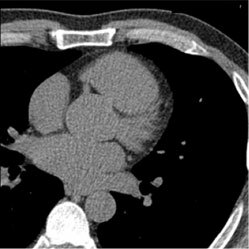 The HeartView Scan requires no advance preparation. captures images of the beating heart and surrounding vessels. This test does not require a physician’s order. The cost is $99 and no insurance will be filed. The HeartView Scan will be read and reviewed by a board-certified cardiologist. whether you have a cardiologist. If not, he will refer you to a cardiologist for a follow-up. your nearest emergency room for immediate evaluation. Test not billed to insurance.